‘King’ Kelly Coleman, front, with fellow Mr. Basketball winners from the 15th Region: (l-r) J.R. VanHoose, Ervin Stepp and Elisha Justice. WAYLAND – They came from all over the state, finding their way from Ashland, Bowling Green, Frankfort, Lexington, Louisville, Monticello, Paintsville and Pikeville, winding their way through the mountains of eastern Kentucky on the first full day of spring, so they could be here to welcome Kelly Coleman home from the hospital and to make sure he knew he will forever reign as the king of Kentucky high school basketball. “King” Kelly Coleman is 80 now and fighting health issues, but his blue eyes are still clear and piercing; he still has the bearing of a man who demands respect, and his accomplishments from six decades ago still amaze. 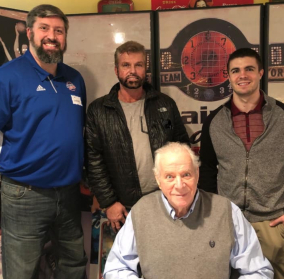 That’s why more than 40 people, including three of Coleman’s fellow Mr. Basketball winners, a Miss Basketball, an Olympian, and a collection of distinguished coaches, gathered at the Wayland Historical Community Center (and its Mountain Sports Hall of Fame) on Thursday. Wayland Mayor Jerry Fultz and Paintsville basketball legend J.R. VanHoose organized the get-together. Nobody appreciates or idolizes Coleman more than those who hail from his home 15th Region. Take VanHoose, who led Paintsville to a Sweet Sixteen title in 1996 and was Mr. Basketball in 1998. He and his wife have become close friends with Coleman over the past five years. “We see him more now as Kelly, not ‘King’ Kelly,” VanHoose said. “He’s like a grandfather to us. When we leave him we tell him we love him like he’s a member of our family. VanHoose noted that Coleman was so talented in basketball and baseball at Kentucky Wesleyan College that he thought he might take up the Boston Red Sox on their offer to draft him and promote him to the majors within a year. But he ultimately chose to sign with the New York Knicks of the NBA. “We’re talking about an amazing athlete, a transcendent athlete,” VanHoose said. Geri Grigsby, who also grew up in Floyd County, was a high-scoring star at McDowell and Miss Basketball in 1977. “I can’t remember a time of my life not knowing about ‘King’ Kelly Coleman,” said Grigsby, who’s now an attorney. “He’s always been an icon to me. Growing up I always heard about him from my dad (McDowell boys’ coach Pete Grigsby). Elisha Justice, who led Shelby Valley to the Sweet Sixteen championship in 2010 and was Mr. Basketball that year, said Coleman “is still the one, still the biggest name. 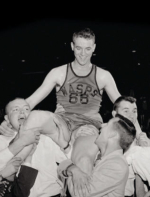 ‘King’ Kelly Coleman was carried off the court during the 1956 Sweet Sixteen. 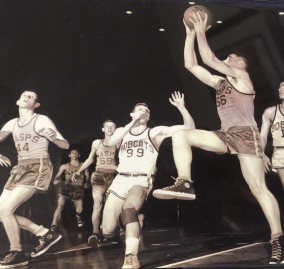 Coleman is still the all-time leading scorer in Kentucky boys’ basketball history with 4,337 points, and still holds the single-season scoring mark with 1,734 points in 1955-56. Coleman’s 68 points against Bell County in the 1956 Sweet Sixteen also still ranks as a tournament record. Ervin Stepp, who set national scoring records at Phelps in Pike County 40 years ago, knows better than most people what kind of pressure the ‘King’ endured as one-man offensive machine. As a junior, Stepp averaged 47.2 points to break Coleman’s state record of 46.8. As a senior, Stepp averaged a staggering 53.7. Stepp heard about Coleman at an early age from his dad, Joe, a standout player in his day. “I remember my dad talking about going to a game at Wayland one night, and he got within a couple miles and he heard on the radio they were saying if you’re coming to see the ‘King’ tonight, you might as well turn around because the fire marshal wasn’t letting anybody else in. Stepp finally met Coleman for the first time in 1996 when the 15th Region honored its top 50 players. Since then, Stepp and Coleman have become friends, trading stories of their glory days. Kenny Davis, the Georgetown College legend who played for the United States in the 1972 Olympics, said the first time he heard stories of ‘King’ Kelly Coleman, he didn’t think he was a real person. “He was about 10 years ahead of me, and I thought it was all a myth. I mean, 68 points in the state tournament against the best competition in the state? It didn’t seem possible. He was bigger than life. Rodney Woods, who was a standout player at Lone Jack in Bell County in the early 1970s, and who’s won more than 700 games as coach at Wayne County, agreed with Richards. When the festivities were over, and the “King” was getting ready to leave the building, Coleman said it had been a “great afternoon,” that he “couldn’t have asked for anything better,” and that “a lot more people came” than he expected. Asked if he was confident that he was the best basketball player in the room of luminaries, Coleman was quick with a reply: “I didn’t see anybody out there I couldn’t beat one one one,” he said with a smile. Fultz and VanHoose are also spearheading a drive to restore the Wayland gym and preserve the legacies of Coleman and the Wayland Wasps. The buidling, which has stood since 1937, is one of the oldest high school gyms in the state. The $1.5 million project is under way, but financial support is needed. Donations can be sent to Mountain Sports Hall of Fame, P.O. Box 349, Wayland, KY 41666. The Mountain Sports Hall of Fame can also be reached on Facebook, and on twitter @MtnSportsHoF. ‘King’ Kelly Coleman, right, in action for the Wayland Wasps.